Acer's latest all-in-one can double as a 21.5-inch tablet if that's what takes your fancy. The Windows 8 running Aspire Z3-600 comes with a rechargable battery and touchscreen so you can use it as a giant tablet if you don't fancy using the hinge on the back to keep it upright on a table. That 21.5-inch display is a full HD affair, while the on-board speakers are Harman Kardon made and it comes with an HDMI-in so you can even use it as your game console or Blu-ray display. The Aspire Z3-600's Intel Pentium processor is a pretty low-to-mid-range affair so we don't expect this thing to perform any computing miracles, despite the 4GB of RAM and 750GB HDD on board. The aforementioned rechargable battery sounds handy but it will only give you 2.5-hours of juice - although since you're not realistically going to take this bad boy out of the house, that may not be too much of an issue. What it will give you is enough power to live tweet your way through Transformers: Dark of the Moon from the comfort of your sofa. But please, please don't. 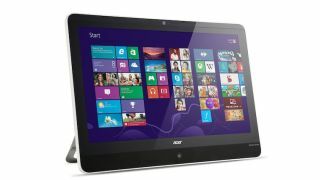 The Acer Aspire Z3-600 will be on sale later in December, with pricing in the US set at $779. Other territories' pricing hasn't been announced yet but that's roughtly £500 in the UK and AU$860 in Australia.